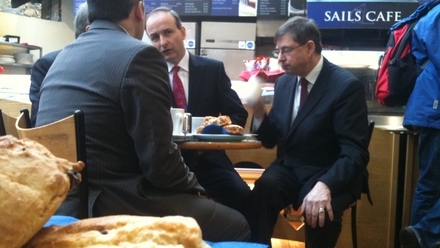 2149 Read Joe Mag Raollaigh's blog after he followed Micheál Martin around Galway. 2139 Willie O'Dea has delivered a stirring speech to delgates at tonight’s Fianna Fáil rally in Limerick city. He praised the new leader for apologising for mistakes of the past, but said their principal mistake was that they did what the prevailing demand of the public was; lower taxes and increase expenditure when the economy was booming. He said however he would not apologise for the improvements in infrastructure, education and social welfare. 2048 Fianna Fáil leader Micheál Martin attended an election rally for over 200 party supporters in Limerick tonight. He was there to support and kick start the campaigns of Limerick city candidates Willie O’Dea and Peter Power and Limerick County candidate TD Niall Collins. Mr Martin and his deputies acknowledged this was the most difficult election facing the party since its foundation, and that it needed to be fought in a very different way. Mr Martin once again accused Fine Gael and Labour of being dishonest with the public in telling them that the EU/IMF deal could be changed, and he predicted that they will fundamentally disagree in Government because their policies are too far apart. 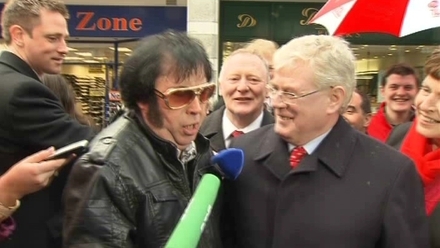 Mr O’Dea accused Eamon Gilmore of engaging in voodoo economics. ‘Eamon Gilmore is the Woody Allen of Marxism, and Enda Kenny is Woody Allen with the jokes,’ he said. 1836 Fianna Fail's PRO for Leinster, Suzanne Collins, has said the party has no plans to ask one of its three candidates in Longford Westmeath to stand down ahead of the election. Athlone's Mary O'Rourke, Mullingar councillor Robert Troy and outgoing deputy Longford's Peter Kelly have all been selected on the party ticket. Rumours had been rife suggesting Michael Martin would be asking for the cut to be made to strengthen the party's hand in the constituency. He was quizzed by local media on Ennis General Hospital, and the reform of the health service - in particular about the downgrading of Ennis hospital. As Minister for Health he had promised that it would not be downgraded. 1729 Bryan Dobson: On Six One News - we're live in Portlaoise with 1st constituency election special from Laois/Offally + latest on worsening crisis in Egypt. 1715 Speaking ealier, Eamon Gilmore said that his party would seek a reduction of 18,000 in public service numbers by voluntary redundancies. 1607 Sinn Féin Dáil leader Caoimhghín Ó Caolain has accused Fine Gael of attempting to con the electorate. 1515 The United Left Alliance has also been launching its campaign. 1415 Joe Mag Raollaigh: During his walk-about in Galway city centre earlier Micheál Martin was generally well received with dozens of people shaking his hand and wishing him well. He was heckled on two occasions and one man who said his son's wages had been cut and he was in danger of losing his house, accused Fianna Fail of destroying the country. 1313 A swift response from Sinn Féin Finance Spokesperson Pearse Doherty to comments from Mícheál Martin - in which he said the rise of Sinn Féin is a threat to the economy. 'It is highly hypocritical of Mícheál Martin to criticise my party on the economy a day after the Central Bank has revised down it growth projections for 2011 down to 1% this year, down from 2.4% three months ago. 1300 David McCullagh: The party leaders are now all off on the campaign trail - and they have more food for thought in the latest polls. An Irish Independent poll this morning showed Fine Gael support dropping - a Red C poll today finds it rising. Celarly, lots of voter volatility out there - and all still to pay for. 1231 Speaking on the campaign trail in Galway West, Micheál Martin said his party would support the correct policies to ensure economic recovery - irrespective of where they are after the Election. He said he will support the implementaton of Fianna Fáil policies by other parties in the next Dáil. 1155 The chairman of the Roscommon Hospital Action Committee - John McDermott - has been confirmed as the group's candidate for the forthcoming election. The former Roscommon footballer said he was going forward after taking into consideration the commitments made by the main parties, including some written submissions. 'A Fine Gael government with Labour in it. That will not make any change or any difference." 1117 David McCullagh: First FG news conference of campaign. 18 minutes late. Mind you, twice the media turnout as for FF. 1110 'Micheal Martin seems to think he can emerge from the worst Government of recent years and expect people to forget all about it' - Enda Kenny. 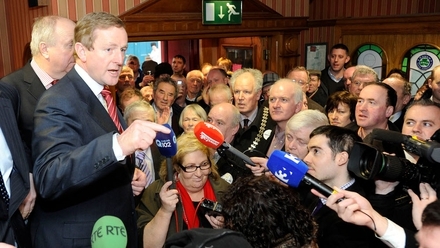 1005 Enda Kenny said his party's plan is 'integrated and coherent' and would provide a solution to Ireland's problems. He said the jobs crisis cannot be fixed unless confidence is restored and the deficit addressed. 0920 Responding to Mr Martin's comments in the last few minutes, Eamon Gimore said Labour differed from Fine Gael on a number of fronts, including the terms of the EU/IMF deal. 0916 'The rise of Sein Fein poses a threat to the country and to jobs,' claims the Fianna Fáil leader. 0915 David McCullagh: Micheál Martin claimed that Labour had 'lost its nerve on the eve of the election' by changing economic policy. Asked about Pat Rabbitte's comments about his front bench, he said he felt they were dismissive of women and showed a lack of respect for people who weren't elected. Mr Martin said that what was worse was that the leader of the Labour Party didn't seem to see what was wrong with them. 0912 Micheál Martin is attacking 'disunity' between Fine Gael and Labour. At a news conference in Dublin, Mr Martin accused the Opposition of putting forward 'false promises' about debt renegotaition. 0906 David Davin-Power: Introducing the party's 68 candidates, Eamon Gilmore claimed only Labour could lead the change the country needed with its vision of one Ireland. He reiterated his belief that 'for the first time in 90 years' the general election was a genuinely three way contest. 0905 Labour is holding its formal campaign launch at the Guinness Storehouse. 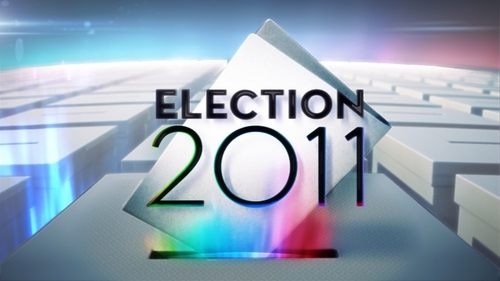 0900 The first full day of campaigning in the General Election is underway. Fine Gael candidates for Dún Laoghaire and Dublin South East were out early - meeting commuters at Westland Row DART station.